Two of our friends made the cross-country move from Oregon to Tennessee a couple of years ago. They lived with us for 2 months while they were house hunting. During that season we shared the kitchen, cooked meals together, and spent many joyful evenings around the dinner table. One of the best things about that time, aside from that obvious (that it was a blast to live with such good friends), was that we got to swap recipes! And this soup is one that my dear friend shared with me. To be truthful, I’m not a huge lover of soups. My grandparents ate soup at least once a week, and I rarely prepare soup once per month in my own home. But with this kielbasa, kale and white bean soup, it was love at first bite. The flavors of the meat are incredible. The beans and kale add a depth to the texture and superfood nutrients. The sprinkle of parmesan cheese over my bowl is like a cherry on top of a cupcake or a bow on a present under the Christmas tree. When I get tired of our typical chicken, pork and turkey routine, I resort to kielbasa. When I feel like my crew isn’t eating enough veggies, I cook this meal. When I invite friends over for lunch or need a quick dinner, this is one of my top picks. Basically, this is the ultimate soup recipe and I’ve yet to find a friend (from a toddler to a grandparent) who doesn’t care for this soup. Hopefully your family and friends agree! It’s love at first bite! 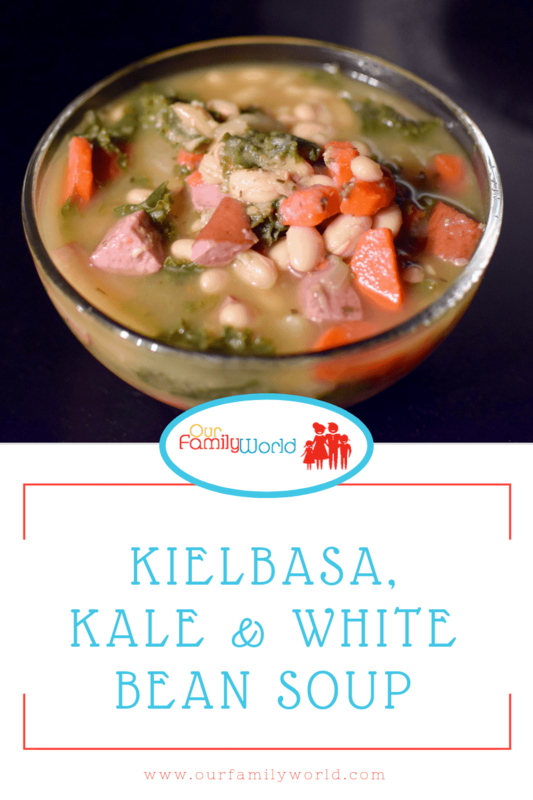 This dinner provides all the protein (kielbasa and white beans) and vitamins (kale and carrots) you want your family to eat at the dinner table. Need more? It pairs well with crusty French bread. Heat the olive oil over medium to medium-high heat in a stock pot. Add the onion and garlic and cook until the onion is translucent. While the onion is cooking, chop the kielbasa lengthwise in half (to get two “hot dogs” each shaped like a semi-circle) and then in half again (to get four “hot dogs”). Then chop each “hot dog” into bite-sized pieces. Add the kielbasa to the pan to brown with the onions and garlic. After the kielbasa has begun to brown, add the carrots, broth, water, parsley, oregano and rosemary to the stockpot. After the carrots are soft (20 minutes), add in the white beans and kale. Put the lid on the pot and simmer for another 10 minutes, until the kale is softened. Pairs well with crusty French bread.